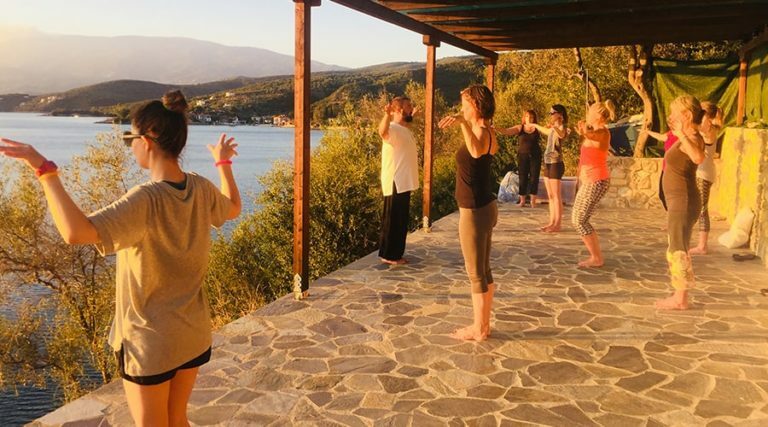 Emma Douglas reviews an enlivening Wellness Retreat at Dolphin’s Leap in Greece and finds delightful company, generous hospitality and brilliant instruction and therapy. The journey to Dolphin’s Leap takes us down the coastal road of the Pagasetic Gulf until we descend a steep hillside through a forest of olive trees. Arriving at our destination, we are stunned into silence by a magnificent panoramic of sparkling sea and distant mountains. Whatever Wellness is, there’s a good chance we’ll find it here. Our home for the week is an elegant Mediterranean villa, where my spacious bedroom feels both calming and energising, floodlit by sunrays that pour through the windows. As a prelude to our first dinner, our group of 10 is guided in a sunset meditation and ‘sound bowl’ session on the terrace. Any tension from the journey melts away as we focus on our breath and the resonant tones of the sound bowls. On finishing, we linger to watch a glorious pink sun disappearing into the sea. 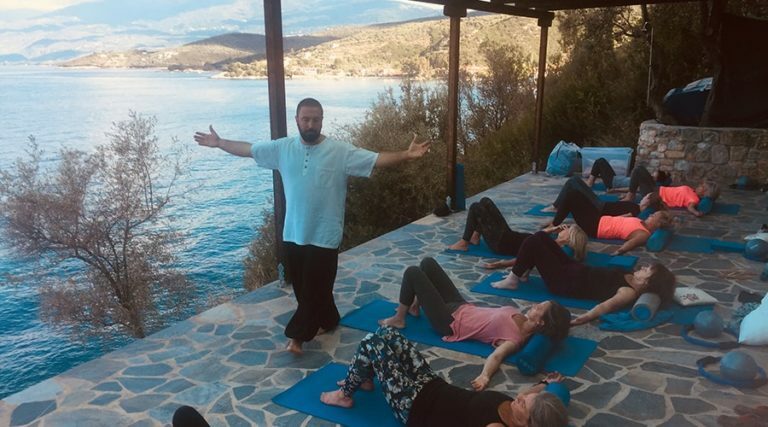 Over a supper of flavoursome Greek dishes, we meet our hosts, Pippa and Nick Dale-Harris – owners and visionaries behind Dolphin’s Leap – and our Greek instructor and holistic therapist Ioannis Dovros. Our group ranges in age between 20s and 60s and is here to ‘escape’, ‘revaluate’, ‘recharge’ or just ‘chill’. 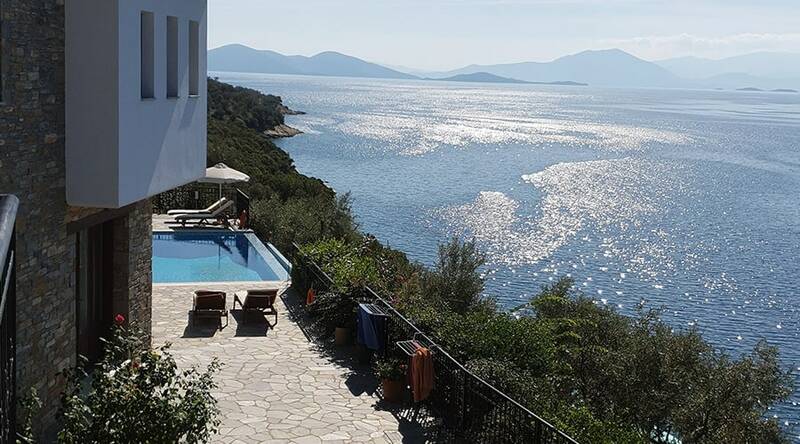 We are seeking simplicity, but our luxury villa in this splendid location is a welcome first step. I’m here for the week-long Wellness Retreat that mixes Pilates with meditation and qigong. Our programme begins at 8 am the following morning with a meditation on the beach. We establish a cycle of breathing through the forehead, eyes, mouth, and chest. This physical feat starts to make sense as we establish a rhythm, tune in to the waves and draw energy from the sky and earth. Pilates is next and we stretch, lift, squeeze and pulse our way through progressively more challenging exercises. Ioannis is careful to adapt exercises to accommodate injuries and correct posture when the odd hip joint objects: “Who make crack? We do not want!”. As I give it my all, I’m reminded to “keep shoulders down – we are not boxing!”. Spirituality is distinctly lacking in this class but as Ioannis confirms: “This is gymnastic”. Having earned our breakfast, we enjoy the array of fresh eggs, wholemeal bread, yogurt, honey, nuts, and fruit, as well as the delicious aromas of lunch already in the oven. Late morning is when many of us book in for personal treatments. I have an excellent head and neck massage and later a craniosacral therapy that leaves me feeling rebalanced and realigned. Others choose Reiki, reflexology or acupuncture. A young nurse with occupational back pain hails Ioannis a ‘hero’ and her mother declares him to have ‘magic hands’ after he eases her neck injury. All agree that his healing effect is remarkable. Lunch is a colourful selection of pre-cooked mezze and salads, laid out so that the group can come and go at its leisure. Some of us come and go twice, confirming our appreciation of Tulla the in-house cook at Dolphin’s Leap. Afternoons are free and an opportunity to explore. 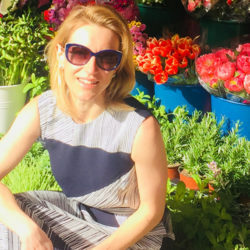 On one day, I join host Pippa for a hike to the neighbouring village of Kalimos, learning about the regional wild herbs and flowers en route. On another, I take a long swim in the sea and have the sensation, surrounded by mountains on all sides, of being in a giant lagoon. Others enjoy a private boat trip, or quality time by the infinity swimming pool with a good book. Early evening qigong is a new discipline for all of us, though ‘discipline’ is a strong word for our early performance. As we learn the gentle movements that will enhance our energy flows, we are more like a gaggle of chicks learning to fly. Ever patient, Ioannis reassures that we are free to ‘express ourselves’, as we exhaust ourselves as much with silent laughter as physical exertion. We dine each evening on vegetarian dishes such as stuffed peppers or moussaka, with lemon potatoes and roast vegetable salads. On Tulla’s night off, we head off across the moonlit beach and up a winding ancient mule path to the local Taverna. Here, ‘wellness’ comes in the form of flowing wine and a feast of calamari, butter bean stew and sweet halva. Overall, our daily rhythm of meditation, Pilates, and qigong strikes an ideal balance between purposeful activity and relaxation. By our final qigong practice, we have become positively graceful in our movements. Eyes shut and caught in the moment, one of the group gyrates her hips in an improvised solo. But we’ve basically nailed it. A concluding session of sound bowls and gongs proves poignant, even emotional. Ionnis encourages us to ‘take something home’ as we continue our wellness journey. Many of us would like to take Ioannis home, but settle for moments of happiness, calm or insight that we have found on this wellness week. Under the Pelion stars, we enjoy the last supper and reflect on our retreat: delightful company, generous hospitality, and the privilege of instruction and therapy by Ioannis in this wonderful setting. We have all come here for different reasons, but we leave with the same view of Dolphin’s Leap: a special retreat, in a very special place.